I made this salad last week for my girl’s supper club dinner. It is such a great Summer salad. This is my spin on a caprese salad but amped up with avocado and crispy prosciutto. The peppery arugula and pesto vinaigrette pair perfectly with the flavors, making for a bright and fresh salad. You can totally assemble this ahead of time but wait to toss it all together with the dressing right before serving. Enjoy! Preheat oven to 350 degrees. Lay prosciutto slices flat on a baking sheet. Bake about 8-10 minutes until they are crispy. Once cooled break into pieces. Drizzle lemon juice over the sliced avocado and sprinkle with salt. 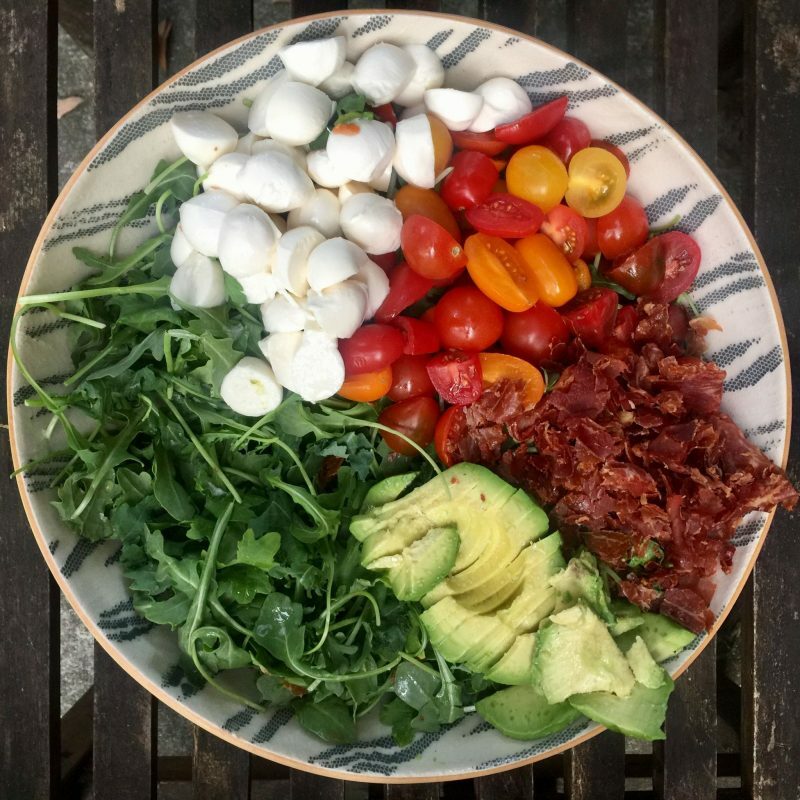 Arrange the arugula, tomatoes, mozzarella, prosciutto and avocado in a large bowl. Whisk together all dressing ingredients. Drizzle dressing over salad and toss all together before serving. YUM. As always, pinning to my recipe board! I made this last night and it was amazing! Trader Joes has parmesan crisps and I broke those up as croutons on top-it was the icing on the cake.